One of the main components landscape design and swimming pool installation is gaining approval from the local municipalities. in2blue will apply for and obtain all city & town permitting required for pool construction, excavation, and all other services in cluded in your project. All plans must comply with local and state building codes, and we will also handle all applicable inspections and final Certification of Occupancy. At this point your swimming pool plans have been approved, your permits have been secured and the in2blue team is ready to make your dream come true. The dig begins by forming out the initial shape of the future structure where pool installation will take place. Next, using transits and other engineering devices, we will get all our exact elevations and depths to conform to the specifications of your landscape design & inground pool plans. Lastly, a 4"-8" layer of gravel is installed, the gravel allows for proper drainage underneath the concrete shell of the swimming pool. Once excavation is complete, framing begins and the swimming pool starts to come to life. The framing sets the tone for the entire pool installation project. We ensure that the pool is level at this point, as well as in proper orientation with house, landscape, and all other structures. The swimming pool shell is constructed using 1/2 inch rebar as opposed to the 3/8 inch industry standard. We also use grade 60 rebar for pool construction (50% stronger than grade 40). The reason for this is that it makes the pool shell that much stronger. We tie our steel 12 inches on center with 6 inch verticals in the deep end that tie into the horizontal runs in the re-enforced bond-beam. The steel is shaped to the pool’s design and extra steel is used at points of high stress. Lastly, the electrician will make all required bonding connections to the steel shell. Rough plumbing or "stub-out" is performed immediately following steel installation. This includes the installation of all main drains, skimmers, light niches, & return lines - including spa plumbing if applicable. Our plumbing systems are designed using proven hydraulic techniques and principals that we have learned through years of hands on experience in pool installation. We also pressure test multiple times throughout this process to ensure a leak-free, watertight shell for your swimming pool. 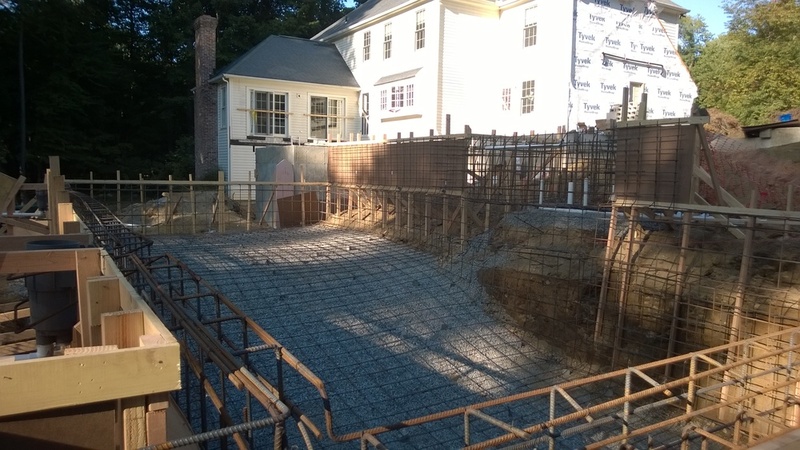 For gunite pool construction, we then pneumatically apply gunite over the steel reinforced cage. The gunite is a highly pressurized concrete that is hydrated at the nozzle during application, which results in lower moisture levels and less chance of slump. For this reason, it is up to ten times stronger than poured concrete. Our gunite pool shells come with a lifetime warranty for as long as you own your home, giving you peace of mind that in2blue stands behind it's product. The next step in the swimming pool construction process is the installation of your waterline tile and coping. Your inground pool will have a frost-free, weather resistant waterline tile that will be hand-laid and carefully grouted around the perimeter of your pool by a skilled crafts person. The coping will be hand-laid and grouted on the bond-beam of your inground swimming pool by the same craftsmen that set the tile. 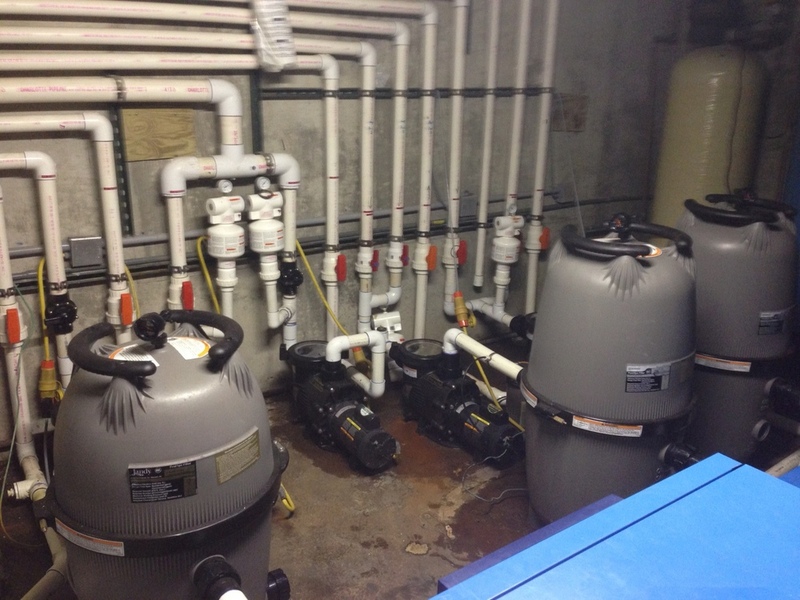 At this stage in the pool construction process, all pumps, filters, heaters, & chlorination systems are installed. The plumbing for each swimming pool is designed specifically to give it the best circulation and filtration for crystal clear water and ease of maintenance. We perform hydraulic calculations to ensure that all equipment and piping are of the correct size to combine water clarity and energy conservation. In addition, we run our plumbing lines side-by-side to avoid future breaks due to ground movement. The final electrical panel is installed and all swimming pool equipment is wired up. Plumbing and electrical are now complete. Undoubtedly the most exciting part of the installation process, the finish line is fast approaching. The swimming pool interior is coated with your choice of plaster. Whether you choose a traditional marcite plaster or an upgraded stone aggregate finish for your ingorund pool, our expert tradesman will ensure a quality job that will last for years to come. The first thirty days of your plaster define the lifespan, that is why there is no need to worry when you choose in2blue. We will cure your plaster for the first thirty days to ensure your new investment remains as durable and aesthetically pleasing as possible. Once your inground swimming pool is full, a service technician will come out to your home and start all pool and/or spa equipment. Once the equipment has been started up and the swimming pool is fully operational, our service manager will set up a time to come to your home and show you the functionality and operations of your new pool. This includes everything you will need to know about routine maintenance on the pool and some troubleshooting tips. If you do have questions or require technical support, our trained personnel are only a phone call away.